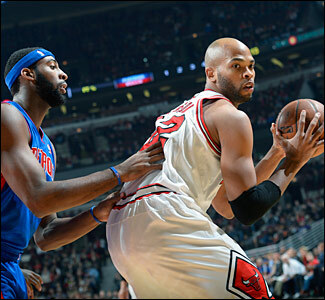 How ‘bout that Taj Gibson! The Bulls forward starting for injured Luol Deng—yes, another one bites the dust—added to the best-in-his-career season Saturday with 21 points and 10 rebounds against the Detroit Pistons. Gibson is averaging 21.4 points and 8.4 rebounds on 61 percent shooting the last five games. The rest of the starting five? “We sucked tonight,” explained Joakim Noah without much objection, part of a nine for 45 shooting rest of the starters that never gave the Bulls a chance after halftime in a numbing 92-75 loss to Detroit. Gibson is averaging 21.4 points and 8.4 rebounds on 61 percent shooting the last five games. It was the Pistons’ first victory in the United Center in their last 15 attempts, but more significantly their fourth straight win to go to 10-10 while the Bulls fell to 8-10 and perhaps heading in the opposite direction. That’s because leading scorer Luol Deng was out with an Achilles problem. It is not regarded as serious and Deng insisted he’ll be back next game. But Deng’s absence left the Bulls to open the game without their entire starting perimeter from the opening of the season. Derrick Rose, obviously, is out for the season. Jimmy Butler remains sidelined and might be back in a week or so from turf toe. Deng is day to day with an unforgiving four games in five nights this coming week. The Bulls with the loss fell to eighth in the Eastern Conference. But considering the disappearing roster, especially on offense, the Bulls had perhaps one chance to hang in against an improving Pistons team. And, inexplicably, the Bulls pretty much ignored it in a crucial third quarter when the Pistons broke open the game. The Bulls had kept it even at 47 in the first half with a good overall effort and just about matching the bigger Pistons on the boards with a strong start from Carlos Boozer and Gibson’s consistent and relentless effort. Gibson had started for Deng at small forward as the Pistons’ lineup produced a providential matchup with Josh Smith at small forward. The Bulls took advantage, opening the game going to Gibson, who scored twice. That continued and Boozer profited with defense dropping off him. 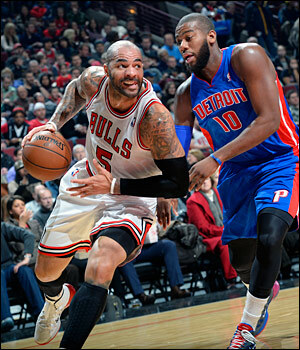 Boozer went on to have 11 in the first half, though shooting three of 11 and only 13 points for the game. Gibson had 12 halftime points as the Bulls main threat without Deng. The Pistons, obviously, would adjust. 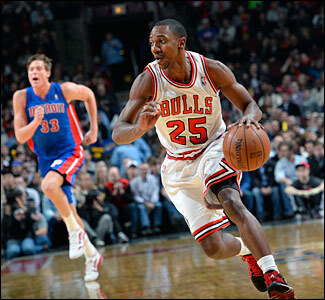 And when the Bulls opened the second half going to Gibson again, Brandon Jennings, who led Detroit with 33 points, the only Pistons starter in double figures in the game, dropped off a guard to double Gibson. Plus, an opposite big man began to hedge. Gibson correctly passed out for an open three, which Kirk Hinrich missed. But then the Bulls played into the Pistons hands, and by the end of the third quarter the game would get away. Teague scored 10 off the bench, but the Bulls couldn’t keep the Pistons from their first victory at the United Center in their last 15 attempts. In the next five Bulls possessions, Gibson didn’t touch the ball a single time. Even if a team is going to double, you have to make them react and thus move the offense. But the Bulls simply ignored Gibson and thus the offense became stagnant. “You have to give Detroit credit,” said Bulls coach Tom Thibodeau. “They were getting down into the post. They were very aggressive with their digs. That’s the responsibility when the second defender comes, to kick it out to the open man. I thought at times we hung onto the ball too long. When the ball moves and our screening is strong, it’s going to be good. The Pistons in the interim going to Andre Drummond against Boozer scored six straight points. The Bulls then turned a bad Josh Smith shot—no real need for the adjective—into a runout for a powerful Gibson slam dunk to be within 53-49 with three minutes gone in the third quarter. Gibson again didn’t touch the ball for three straight possessions until he combined to assist Tony Snell on a jump shot. Even still, the Bulls only trailed 53-51 with 6:54 left in the third quarter as the Pistons were fumbling the ball all over the place. The Bulls were competing, though not cleverly. Again, the Bulls ignored Gibson two straight possessions. On the third they seemed to remember who he was and he was fouled, making one of two. The Bulls were down just three with 4:07 left in the third. It hardly suggested the blowout it became. But reserve Josh Harrelson banged in a three, starting an 11-0 Detroit run as the Bulls this time didn’t throw the ball to Gibson for the next six possessions. Not that there aren’t other guys who can score. They’ve demonstrated that plenty. Though they weren’t doing much this night. Mike Dunleavy with 16 points off the bench and Marquis Teague with 10 both played well. Nazr Mohammed played briefly and the Bulls went basically with seven players with the injuries. Gibson finally got the ball again and made a tough move inside to score, pulling the Bulls then within 66-54 before Kyle Singler made a three off yet another scramble in which the Pistons got the loose ball. By the end of the quarter, the Pistons had taken a 71-56 lead, a quarter in which Gibson had five of the Bulls nine points along with an assist. He shot two of two while the rest of the team shot two for 18 in the quarter. Yet, they kept shooting and he kept watching. There are many theories on offense. One of the big ones in the NBA is to go to your hot hand, to make the other team stop him. Or at least make him a major threat to get open shots for other players, to move the defense to open driving lanes as well. The Bulls did pretty much none of that after halftime and after a little flurry to start the fourth quarter, the Pistons pulled away and piled it on. The Bulls concluded with a season low in points while shooting 33.3 percent and back to poor long range at three of 18. Conversely after defending Miami hard to the three point line in Thursday’s win, the Bulls again failed to challenge well enough and the Pistons shot a blazing 63 percent on 12 of 19 threes. Though the Bulls didn’t much help themselves with the way they approached their offense. Because even against taller players like Drummond and Greg Monroe, Gibson was powering inside, a rebound and dunk early in the second quarter for a 33-27 lead and then a bit later a powerful slam dunk when Monroe tried to overplay him and Gibson sealed and got the pass for a dunk. With a little help from their friends in the Bulls jerseys. “I just think we got a little stagnant after playing in a rough first half,” said Gibson. “Kind of lackadaisical. I felt like the looks were there. We just couldn’t make shots early. They got out on the wing. It came down to our defensive transition. I feel like we didn’t contain the three point line too well. They got a lot of open threes and that’s what helped them get back in the game.